Polaris Outlaw 90 Youth ATV - Is it the Best? Polaris Outlaw 90 Youth ATV - the Best Youth 4 Wheeler? So for an older youth do we think the Polaris Outlaw 90 would be the best choice in the class? That's the question we'll try to answer. What we will do is spend our valuable time fact finding for you because - well, it's our job. Then I guess it will be up to you to vote with your checkbook. Here's what we found out. Like the smaller Outlaw 50 and the Phoenix 200, the Polaris Outlaw 90 is built in Taiwan by AEON to Polaris specs. That gives Polaris a way to offer a good quality Youth ATV at an affordable price - and with the backing of a major dealer network. Something missing from most Chinese ATVs. 2013 Outlaw 90 in blue. The Outlaw 90 is intended for older kids ready for more power and speed. It's considerably larger overall than the 50, and with upgraded suspension to handle the increased speed. It's not an ATV racer by any means, but it's a significant step up from the 50. With it's larger proportions, it is a racy looking youth quad. It also gets daytime running lights for that "grown-up" look. Air cooled four-stroke engine with electric and kick starters. Safety equipment - Safety tether kill switch with wrist strap. Orange whip flag. Also included is a DOT approved helmet and rider training DVD. Stylish with good performance and handling for it's intended use. (not racing!). Solid build quality for the price. Easy starting but may require some warm up time. Or a jetting adjustment. Good size for bigger kids. Drum brakes don't like mud and water. If you run in the slop, the stock drum brakes need to be cleaned out afterward. Don't say I didn't warn you! Several owners had battery problems that seemed to stem from a retention strap not being installed. Not reported on newer models. Suspension that seemed too stiff on some older models. Just as many raves for the "great" suspension. First thing I would check is for pivot attachments at the rear swingarm and front A-arms being too tight and binding the movement. May be a dealer prep problem because it was such and inconsistent complaint. Some swingarm cracking at the welds reported on older models - none on newer ones. Could also be caused by over tightening of pivot bolts. Engine performance issues like poor cold weather running, rough idling, etc. Probably related to incorrect jetting and should have been fixed by the dealers. Polaris Outlaw 90 pretty in pink. Is the Polaris Outlaw 90 the best choice in class? 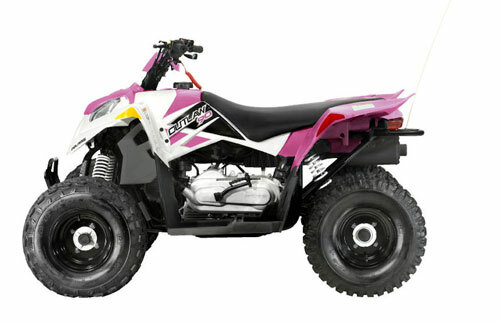 Here's a dirty little secret - most of the 90cc Youth ATVs from major manufacturers are pretty good. If there were one that was head and shoulders above the rest - we would all know about it. So it really comes down to which one you like the best. Test ride them yourself. Be honest about what you expect the ATV to do. And above all else, find a dealer you like. I will say that with it's "Big Boy" looks and solid performance, the Outlaw 90 is definitely in the hunt. Polaris Outlaw 50 - Is the Polaris Outlaw 50 the Best Choice for a Youth ATV? Find Out in This Exclusive Report. 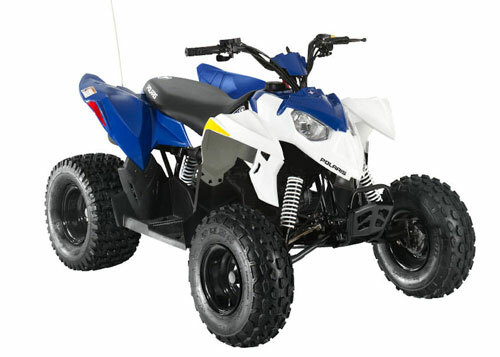 Youth 4 Wheelers - Learn which features of youth 4 wheelers are must haves. Youth ATV Safety - See the latest in youth safety equipment and learn tips to keep the kids safe. Polaris ATV - Exclusive Guide to the Polaris ATV Models Complete with Reviews, Videos, Specifications, and More.